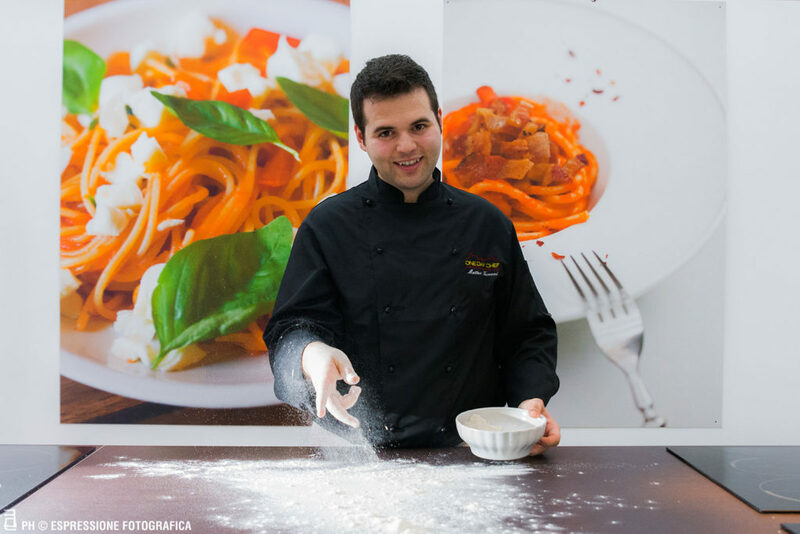 One Day Chef is the cooking school for tourists in Rome. The courses take place in totally practical way: the chef shows the steps to follow and the participants replicate, each individually, in their desk, in individual portions, the dishes on the menu. The duration of the course is 3 hours, with two rounds available daily: mornings from 11:00 to 14:00 and afternoon from 16:00 to 19:00. The lessons are suitable for couples, small groups, families, even with children from 7 years and over, and those who wish to have fun in the kitchen, learning to make dishes of Italian traditions and avoid the mistakes that can ruin your dinner. Not a chef who wants to impress with innovative dishes but simple recipes of the foods actually eaten in Italian homes. We are in Viale Carlo Felice 25, in front of Basilica of St. John Lateran, in a unique structure: a kitchen with 16 workstations and 16 cooktops which enable our guests to cook individually and independently; it all takes place on the street level that makes, the present protagonists of a show in the eyes of passers, looking through the windows.